Sign up for free and just shop with Amazon.co.uk as normal. Our members earned £30,000+ at Amazon.co.uk in the past month. Only purchases made in the product categories listed above will be eligible for cashback. Amazon.co.uk cashback can be earned simply by clicking through to the merchant and shopping as normal. Amazon.co.uk Cashback is available through TopCashback on genuine, tracked transactions completed immediately and wholly online. Cashback will be paid if gift cards are used to purchase. Cashback will track the day after purchase. Shop for everything from clothing and jewellery to music and technology from Amazon, which has gone from being an online bookstore to the largest Internet company in the world in terms of revenue. You will find a huge range of products at low prices on Amazon.co.uk, while as well as selling items, they produce electronics such as E-readers, Fire tablets and Echo devices. Although you are sure to find amazing prices, you can save even more if you join TopCashback and take advantage of our Amazon cashback deals, while you might even find Amazon discount codes, which will allow you to make double the savings. 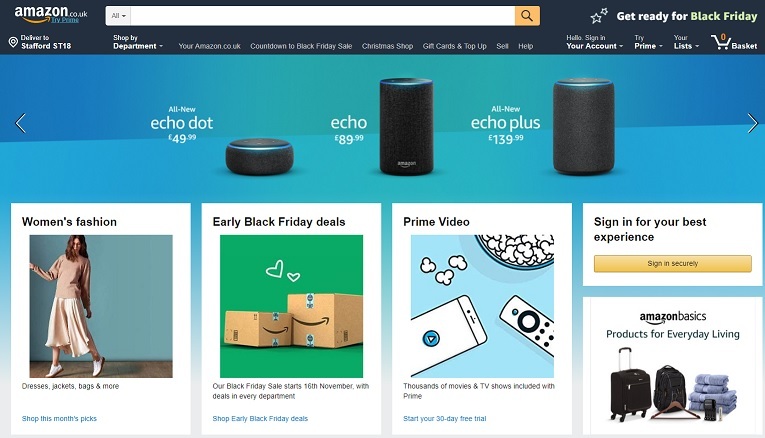 Take a look at their Today's Deals, where you will find discounts and Amazon sale items, though these daily lightning deals, which could be on electronics, games, homeware or beauty products, are only available for a limited time, while you are sure to find some amazing Amazon deals on Black Friday. Sign up to Amazon Prime for unlimited one-day delivery and a host of other benefits, including Prime Video and being able to browse a vast Kindle owners' lending library, order a subscribe & save subscription or buy gift cards for friends and family. Sign up for an account and you will be able to view your orders and contact a seller, make a wish list and manage your content and devices. Also, while they no longer offer Super Saver delivery, you can still get free delivery with some items. Whatever you are looking to buy, search a wide range of products by department on Amazon UK and you will find superb items from the biggest brands at great prices. If you love to have the latest tech at your fingertips, the global online retailer offers 4K UHD TVs, digital cameras, mobile phones, Bluetooth speakers, headphones and gaming laptops from big-hitters like Canon, Sony, Apple, Samsung and Acer, as well as Kindle Paperwhite E-readers. Followers of the latest fashion will find clothing, shoes, boots and accessories by leading names such as Hugo Boss, Tommy Hilfiger and Calvin Klein, while they also sell sportswear and sports equipment, including Nike trainers. If you need something for the home, you can pick up Hoover and Morphy Richards kitchen appliances, DIY tools, garden furniture and more, plus smart home solutions. Discover baby food and other essentials from brands like Pampers, while if you are looking for Christmas or birthday presents, you can buy everything from LEGO toys, Maybelline cosmetics and fun gifts for students to CDs, Blu-rays and limited edition consoles and games. Whatever you want to buy, make sure you check to see if we have any Amazon cashback or discount code offers, while you can also browse Amazon's Today's Deals section. Those seeking an Amazon discount will find one of the easiest ways to get one is by selecting one of our cashback offers and getting money back on a purchase. Shoppers in search of more money off will find tons of other ways to save, and one of the best ways to start is by checking some of the latest Amazon deals. By selecting the option from the menu you’ll discover the Today’s deals section, it’s here you can browse from thousands of limited time low and cut-priced items across a host of categories. Some deals change daily while others last only a few hours, be sure to check back regularly to catch the best; alternatively, you can make it easier and get updates by subscribing to the Amazon deals newsletter. For even more great priced goods be sure to take a look at Amazon’s outlet area that’s available for each category alongside a corresponding special offers section. Furthermore, you can shop the Amazon Warehouse page for some of the most significantly low-priced items on site, so long as you don’t mind buying used, refurbished or returned. There’s no need to worry about receiving a defective product as any imperfections with the items are clearly listed, but if you are unhappy, you’ve still got up to 30 days to make a return. Anybody that makes a regular purchase on the same product can utilise the auto-delivered, Amazon Subscribe & Save service netting you 5% off, and by choosing five select items, you can get a bigger 15% saving. In addition, you can also knock 20% off your first subscription delivery by ordering with one of Amazon’s discount vouchers, and they’re found in their own dedicated section along with a host of others for percentages off other categories. If you make a lot of orders, you may find that you could save overall when purchasing an Amazon Prime membership. One of the biggest benefits, as you may already know, is the ability to get access to free unlimited next day delivery, but there is a whole range of other features too. If you’re stuck for time and need something fast, you’ll find that prime members in select locations can order to get some items for the same day, and at no extra cost. Meanwhile, you can even save if you’re not in a hurry for specific items, and by selecting Amazon’s no rush delivery at checkout, you’ll unlock credit to use on different Amazon products. If you’re not sure about Prime you can try it out for 30 days for free, and don’t forget that Amazon prime gives you extra services such as books, music and films, so make sure not to miss out. If you’re lucky enough to be a student, you can seize a discount on Amazon Prime at half price, and not only that, students also get a six-month trial, plus additional bonuses such as discounts like 10% off books or 20% off Amazon Basics. Amazon also have a range of devices which will make your life easier. The Amazon Echo is a hands-free speaker which you control with your voice. It connects to the Alexa Voice Service, which will do everything from answer questions and provide you with the latest news to play music and make calls. It has seven microphones and beam-forming technology, which means it can hear you from across the room, while its speaker can fill any space with sound. Just say 'Alexa' and it will spring into action. Play music in more rooms across other Echo devices, while you can also use it to switch lights on and off, turn up the heating or order pizza. There are other devices in the Echo family, including the Amazon Echo Dot and Echo Plus. The Amazon Fire TV stick, meanwhile, will get you streaming in minutes when you plug it in to your HD TV, and you can even use the included Alexa Voice Remote to search across apps. It has the fastest Wi-Fi of any media stick and will give you access to Amazon Video and Netflix, plus direct access to YouTube, Facebook and Reddit. Take advantage of all the Alexa features, while you can pair Alexa with your Fire TV stick. Take a look at an Amazon Fire tablet, meanwhile, and you can read, watch, play or listen wherever you are. Enjoy unlimited one-day delivery on millions of items and a host of other great benefits when you become an Amazon Prime member. Get your order in one day or even the same day if you live in certain areas of the UK, including London, Manchester, Birmingham, Glasgow, while you can also choose from flexible delivery options which fit in with your busy schedule. As well as delivery benefits, if you are a Prime member shopping on Amazon UK, you will have early access to lightning deals, Prime-exclusive brands and discounts, while you can also save up to 20% on nappies and baby food when subscribing to five products. Prime members at Amazon can also make use of Prime Video, with which you will be able to watch thousands of blockbuster movies and hit TV shows on your TV, PC, tablet or mobile device at no extra cost, including Prime Originals such as Manchester by the Sea and The Grand Tour. You can choose to stream online or download and watch offline. If you love your music, sign up to Prime and you will be able to stream more than two million songs ad-free. Whatever you enjoy listening to, you can do so on your Echo device or take your music with you with offline listening. Avid readers can download one of six editors' picks to their Kindle for free with Prime membership, with books available before their official release date, while Prime Photos provides you with unlimited storage on a free app which will allow you to see them on multiple devices and share them. They also offer Prime Student for people in higher education. If you love listening to the latest tunes or classic tracks, the Amazon Music Unlimited streaming service will give you instant access to 50 million songs through the app or the Internet, as well as playlists curated by music experts and personalised stations. You will be able to enjoy the best new music all of the time, on demand and free from advertisements with unlimited plays. New albums and songs are typically added to the catalogue on the day they are released in the Digital Music Store, while you can listen to music offline too with unlimited skips -- or go hands free with Alexa. If you are a new subscriber, you can take advantage of a 30-day free trial, with a subscription costing £9.99 a month thereafter, or £7.99 for Amazon Prime members. No matter how many months you have used it for, you can cancel at any time. You can listen to music on a host of supported devices, while when it comes to streaming, you can do so on one device at a time with a personal plan or up to six at a time with a family plan. If you are an Amazon Prime member, you can shop for everyday essentials like grocery items, household products, pet care essentials and more in everyday sizes. Whatever you are shopping for, you can fill a virtual box with products from the Amazon Pantry and have them delivered to your door for a flat fee of £2.99 per box and 99p for each additional box which is part of the same order. Stock your food cupboards up with fresh pasta and bakery goods, ready meals, cereals, tins and more, plus snacks for you and the kids, while when it comes to drinks, they stock everything from tea and coffee to beer, wine and spirits. Shop for health, beauty and baby products or office supplies, while you are sure to find some amazing special offers which will save you money. Benefit from Amazing Offers and a Free UK Delivery on Eligible Orders Today! Track Packages. Gift Cards Available. Cashback is only available for specific products.